We publish a lot of wildfire imagery on our natural hazards page (particularly after the wildfire season ramped up recently in Colorado and other states in the western U.S.) Most of the imagery is acquired during the day by instruments on polar-orbiting satellites: the Moderate Resolution Imaging Spectroradiometer (MODIS) on Aqua and Terra, the Advanced Land Imager (ALI) on EO-1, or the Advanced Spaceborne Thermal Emission and Reflection Radiometer (ASTER) on Terra. So it caught our eyes when this image of wildfire smoke at night—captured by the Expedition 31 crew on the International Space Station—turned up on Marshall Space Flight Center’s Flickr page. 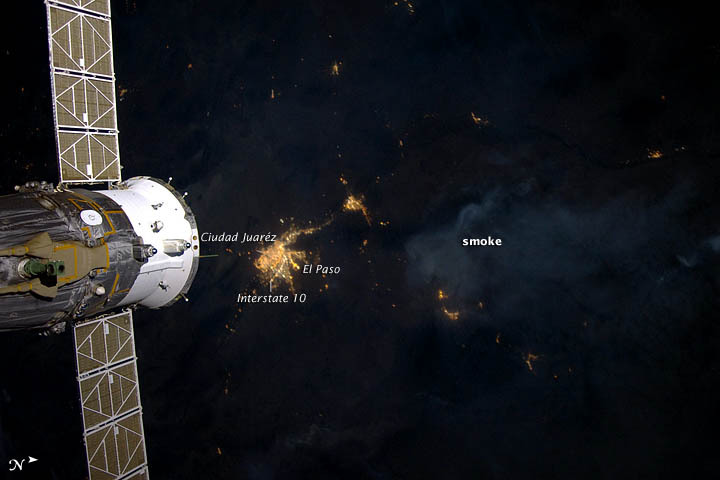 Faint smoke is visible drifting near Ciudad Juaréz, Mexico, and El Paso, Texas — neighboring border cities along the Rio Grande. It isn’t possible to distinguish the U.S./Mexico border, but a line of lights along Interstate 10—which is slightly north of the border—is visible. (See this story about city lights viewed from space for a clearer view of Interstate 10 and the border). It’s likely the smoke originated from the Whitewater-Baldy wildfire, a large blaze that has been burning 225 miles to the northeast of El Paso in Gila National Forest. The photo was taken on June 2, 2012, with a Nikon D3S, a digital single-lens reflex camera identical to what’s available to consumers. 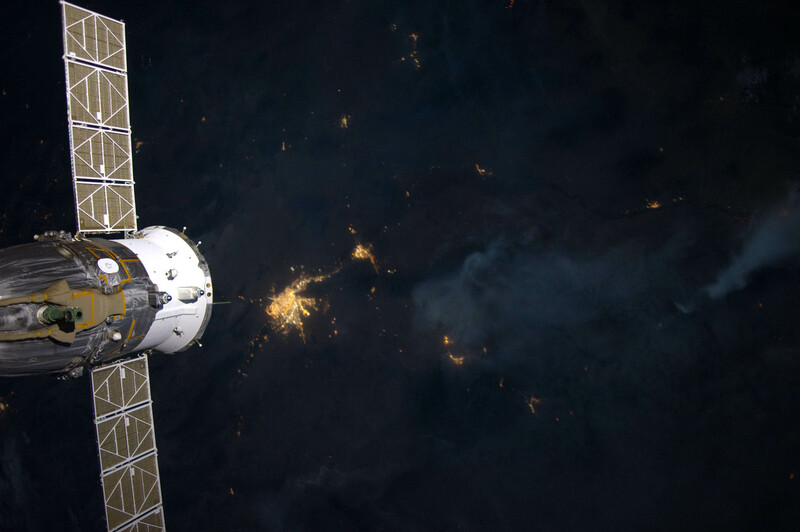 A Russian spacecraft docked to the station is visible on the left side of the image. This entry was posted on Monday, July 9th, 2012 at 10:25 am and is filed under Uncategorized. You can follow any responses to this entry through the RSS 2.0 feed. Both comments and pings are currently closed.